The critic is easy enough to recognize, but what about the cynic? Who is he? Cynics are chronic side-liners with a clever excuse. He is justifiably jaded and you can’t possibly understand how he feels or comprehend what he knows. So how are we to deal with the cynic so we can get some sleep? Don’t swallow the nocebo. You’ve heard of a placebo, but have you ever heard of a nocebo? Didn’t think so. Lissa Rankin M.D., in an article published at phsychologytoday.com, reports that negative beliefs can harm your health. As powerful as the positive suggestion of the placebo is the negative suggestion of the nocebo. Patients given placebos, but believing they are taking the real medications, have actually seen ulcers heal, drops in blood pressure, and warts disappear. Even men who “believe” they are taking Rogain, but are actually taking sugar pills, begin to regrow hair. The cynic is the street dealer of the nocebo. The nocebo is the negative side of the power of suggestion and can be as harmful as a placebo is helpful. The Bible is way ahead of the studies. Over 3000 years ago, Solomon reported, “A joyful heart is good medicine, but a crushed spirit dries up the bones (Prov. 17:22).” If the nocebo effect is real, all the more reason why you can’t allow the cynic to become the dominant voice in your head – or you will lay awake at night. You will never sleep if the cynic’s voice becomes your bedtime song. Test his lyrics – is it true? Is it honorable? Is it just? Is it pure? If not – take no thought of it. Consider what he says, not the way he says it. For some reason the cynic’s spirit is crushed. Try to dismiss the spirit of the cynic, but don’t be so prideful to think that nothing can be learned from him. His information may be helpful. It is his attitude that is not. Often cynics develop out of bitterness from the disappointment of a past mistake. There may have been a time in which he was very eager, extremely hopeful – but failed to meet expectations. Again, apply Paul’s series of questions from Phil. 4:8 – Is it true? Is it honorable? Is it . . . ? I despise the cynic’s whine, but I may be able to learn from his experiences. Remember, it’s not about you. The goal of the cynic is to do to your soul what has been done to his – crush it. Again, discard his attitude. His pessimistic sense of reality is a defense mechanism. If the cynic can give you every reason “it won’t work” he doesn’t have to get involved and relive the hurt. This being the case – try not to take his attitude personally. His cynicism is not ultimately about you, it is something in him. The cynic points out every reason it won’t work. It gets in your head. Negativity doesn’t require a megaphone, your brain will provide the amplification. The good news is, our faith requires us to be more hopeful than perfect. Yet, when Eeyore begins to give counsel, you lay awake at night dejected that not everyone is as excited about the task as you seem to be. Don’t back down from your assignment, vision, or involvement. The cynic is petrified by his realism. Don’t be blinded by your idealism. The cynic’s pessimistic realism is misguided in thinking that because the world is not right, he does not have to be involved. You may be tempted to think that because not everyone is excited about the possibilities as you that the whole thing is doomed to fail. Really? So there’s someone out there who doesn’t think it will work. If you’re totally deflated by that reality, the cynic is not your problem. You’ve got self-righteous, idealism issues! The cynic may be a well placed thorn of grace. Your idea may be great, but if it is absent of humility and dependence, it needs deflating. The cynic is a master of sucking the air out of a moment. Your sleepless night may be a blessing in disguise, pray to God for help. Every task we accomplish requires some degree of redemption. So someone disagrees. You don’t have all the answers. It may not all go according to plan. The cynic sings – so what. Whatever we do, we don’t want to join the cynic’s “premature disappointment with the future.” Press on. See what happens and how God works. The lens of the gospel calls for us to understand that we live in a world that is disappointing. Not every idea will work, in every situation, at every time. 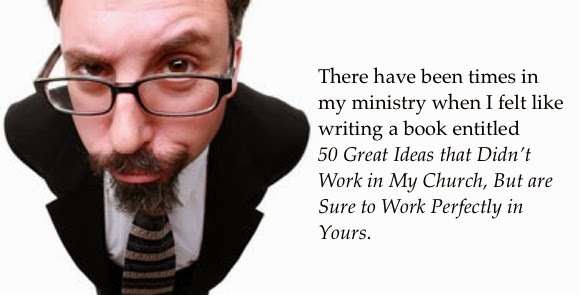 There have been times in my ministry when I felt like writing a book entitled 50 Great Ideas that Didn’t Work in My Church, But are Sure to Work Awesomely in Yours. The cynic allows his disappointment to embitter him. The realism the gospel calls us to helps us to see that our set-backs can become set-ups. There is always something to be learned in Christ. We guard ourselves from the cynical soul as we realize that ultimately everything comes back to Him – bitter disappointment, triumph, tragedy, victory. Christ makes everything count. The gospel informs us that to become as distrustful as the cynic is extremely distasteful. It is also dishonest. Yes, we may be disappointed. We may fall flat on our face. But it’s worth the risk. Why? Because Christ makes all things new. We have reason for hope.